They have managed to write some very heavy songs whilst retaining a keen sense of melody. Aeraco are a four-piece band hailing from Chicago, Illinois. The band consists of the bizarrely named Ace on guitars and vocals, Creature on bass, Spidey on guitars and Misfit on drums. Aeraco had a desire to make music the way they wanted, without the influence of a record company or even producer. It is therefore a case of "hats off" to the guys as, with 'All Or Nothing', they have managed to create an album that blends early eighties Metal with Modern Hard Rock and in doing so have forged themselves a distinctive sound. Yes, you can hear their influences throughout but all in a very positive manner. '...Nothing' was recorded in just six days and as a result the production is a little raw and muddy at times, but that only adds to the appeal of the album. The Modern Hard Rock of 'Into The Night' kicks off the album and immediately lets the listener know that the band intend on taking no prisoners. Next up is 'Hero' with its heavy riff and, like most of the songs on the album, is very contagious after only a few listens. The raucous 'Grimm', featuring gang vocals, is the heaviest track on the album and is foot-tapping Metal at its best; it's an offering that harks back to the halcyon days of NWOBHM. The pace drops with the superb, but still heavy, ballad 'Running In Shadows' and this is one of the real highlights. The double-kick drum of 'Destruction' signals another Metal onslaught whilst 'LaLa' is fantastically melodic whilst remaining heavy and Ace's vocals, as throughout, are very infectious. The six minute-plus 'Lullaby' has an Iron Maiden/Metallica intro before launching into a full-throttled, melodic attack on the senses and features blistering solos from Ace and Spidey. The album concludes with several modern sounding Hard Rock tracks starting with 'She's A Lot To Lose', 'This Life' and the acoustic-based 'Feel The Wind'; the latter being something you could imagine being a smash on MTV. 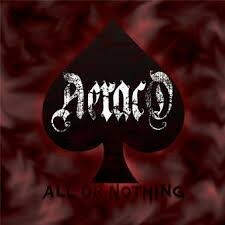 From the songs on offer on '...Nothing', it would appear that Aeraco are equally at home playing Modern Hard Rock as they are at blistering Heavy Metal. Similar to British bands Fuyron and Fahran, they have managed to write some very heavy songs whilst retaining a keen sense of melody. 'All Or Nothing' is only available as a digital download and I would recommend the FLAC files, as the album deserves to be played as loud as possible!